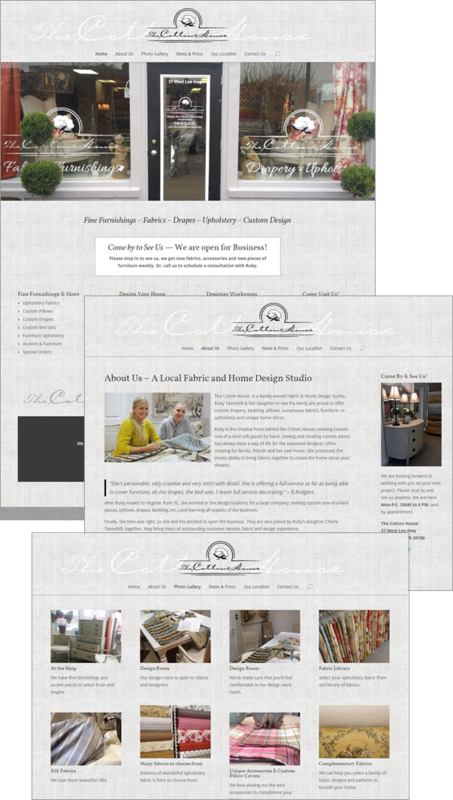 A wonderful new business in the heart of a small but growing town, The Cotton House needed an online presence. They went to a local designer who completely failed them. After paying nearly $1,000 for a very poor looking template, they discovered the designer did not even know how to upload the site onto their hosting server. We found out about their plight and came in for the rescue. We did a quick custom overlay using a great WordPress theme, and got them up and running within a week — just in time for their open house. Because of the type of business, we felt it was important to bring in the use of texture, class, and quality as much as we could. A grey linen was used on the page backgrounds to pickup colors from the actual brick and mortar store, and become a subtle reference to fabric. They already had a great logo, so we repeated the script from the logo in other key places to add even more depth and texture to the visual site design. In order to deliver more than a one page site, like the one they had, we carefully gathered potential content by looking at all the goods and services they offer. This approach enabled us to develop a full 6 page site, complete with a photo gallery to make any potential customer feel comfortable doing business with them. In addition, we noticed that Google Maps didn’t have their listing mapped to the correct location. We submitted change requests to Google Maps, and got that updated for them, so customers wouldn’t have to guess where they really were. These ladies are talented and produce a quality product, and we helped them shine with their very first website. Go get’em, Cotton House!